Hey everyone! For those of you who don’t already know, my name is Lena and I have the honor of being the first OWUSS/AAUS Mitchell Scientific Diving Research Intern. I’ve included my full biography below for those of you who want to know a bit about my background, otherwise I will get right in to telling you about the start of my internship and some adventures I’ve been up to already. I am 21 and just finished my sophomore year studying Marine Biology at the University of Hawaii at Manoa. 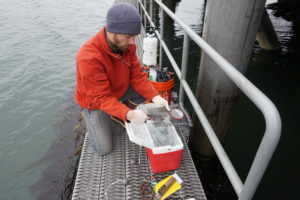 Originally from Santa Cruz, California, I have grown up connected to the ocean and chose to study biology in order to combine my love of conservation and diving. In high school, I volunteered with The Marine Mammal Center, helping rescue stranded marine mammals along the California coast. I became PADI Open Water certified in 2014 during my senior year of High School. After High School, I embarked on a gap year, traveling to Thailand, Cambodia, Vietnam, Fiji, and Madagascar. In Thailand, I volunteered at Elephant Nature Park, and had the unique experience of assisting with the rescue of an injured and abused elephant. In Cambodia, I taught English to second grade Cambodian children. In both Fiji and Madagascar, I had my first experiences with scientific diving, doing fish and invertebrate surveys as a volunteer with a non-profit group. Living simply on small islands and diving almost daily I found my passion, bringing together diving and scientific study. While in Fiji I gained my PADI Advanced Open Water, Rescue Diver, and Dive Master certifications. Subsequently, I worked as a dive master in Fiji, deepening my love for the underwater world. Determined to keep excelling as a diver, I earned my AAUS Scientific Diver certification in the Spring of 2017. I am excited for this summer and the opportunity to acquire new scientific diving skills. 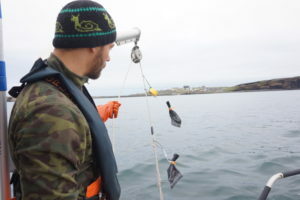 This summer, I am working closely alongside doctoral student Jared Weems as he conducts his research on Blue King Crabs (BKC) around Saint Paul Island (SNP), located in the Pribilof Islands in the Bering Sea. 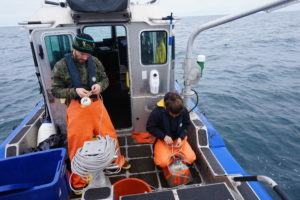 With the goal of understanding the difficulties behind stock recovery of BKC after severe overfishing prior to 1999 when direct harvest was closed, Jared has dedicated his time and research to studying three possible causes: larval supply, predation on juveniles, and habitat availability. Detailed info about Jared’s research can be found on his website, Pribs Blues Muse, https://www.sfos.uaf.edu/research/pribsbluesmuse/, but I will tell you a bit about the methodology of each project as it comes up throughout the summer. My summer is broken up into two asymmetrical chunks of time or trips to Saint Paul, the first of which I have just finished. 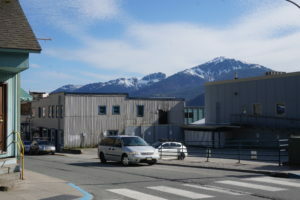 I left home in California on May 18th, just a week after finishing school, and flew up to Juneau. After a couple days of shopping for food and supplies, where I got my first ever pair of XtraTufs, a staple in Alaskan work and style, Jared and I began our journey to Saint Paul. 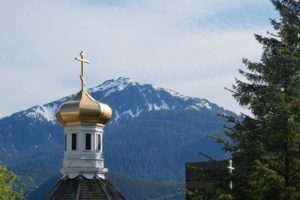 We left Juneau in the morning and after a short stopover in Anchorage and then Dillingham where we waited for the weather to clear, we made it to Saint Paul on a flight full of birders, undoubtedly heading to the island to explore its world renowned sea bird colonies. We arrived in Saint Paul to surprisingly nice weather and settled in at the NOAA Staff Quarters. (For anyone interested in the history, Saint Paul has a unique story involving Russian slavery and the Fur Seal trade prior to Aleut Independence). 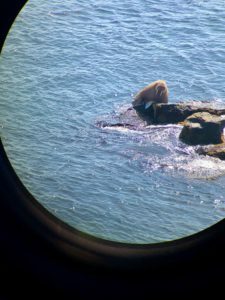 Saint Paul, also one of the 2,500 islands that make up the Alaska Maritime National Wildlife Refuge, is home to arctic fox, a reindeer herd, fur seals, stellar sea lions, harbor seals, whales, colonies of millions of sea birds (and the extremely rare walrus! 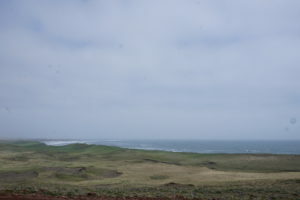 pictured later). Taking advantage of the good weather, the first few days of work were long and packed with preparation as we waited for our dive gear to arrive on another plane. 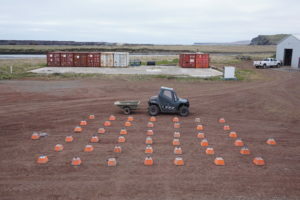 We prepped and painted 44 concrete blocks, which will later act as anchor lines for our survey sites around the island. 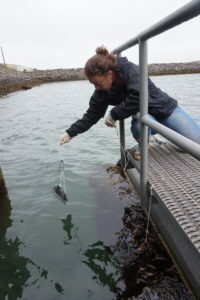 We also made 125 glaucothoe settlement bags, which are placed around each of the anchors to collect juvenile crabs over the course of the summer in order to assess population abundances. 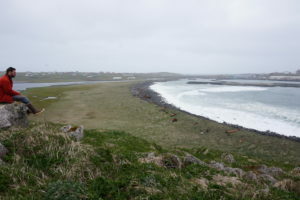 After days of preparation and the start of a streak of bad weather, we waited out the wind and the seas inside and exploring around the island. 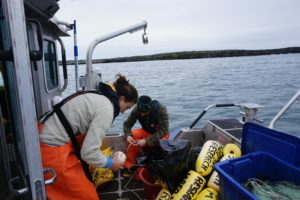 I began learning my cold water species of algae, fish, crab and other invertebrates while Jared worked on calibrating the cameras for the deep water camera drop surveys and making bread in his beloved bread maker. When our first weather window to go out on the water appeared in the forecast we loaded up our concrete blocks on The Lunax, the islands amazing rescue boat, and headed out to set as many of our sites as possible. It ultimately took two days and lots of energy from peanut m&m’s but we finished putting in all but two blocks. Another project that we worked on, as I mentioned a bit earlier, was the camera calibration. 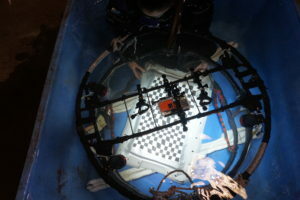 Sheila, so named by Jared’s tech from last summer, is a modified crab pot that holds a stereo GoPro system used to assess the benthic habitat at deep water sites. With bad weather and one unsuccessful attempt diving in the harbor to calibrate Sheila’s camera, we decided to get creative and think of another method to calibrate the cameras in water. Later that day, I found myself suiting up to climb into a fish tub filled with ice cold water at the Trident Foods warehouse. 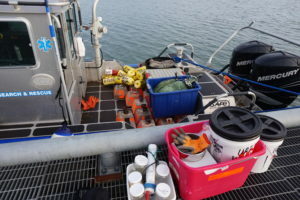 One of the final projects we worked on was deploying SPATTSs (Solid Phase Absorption Toxin Tracking) as part of a harmful algal bloom (HAB) study in the area. 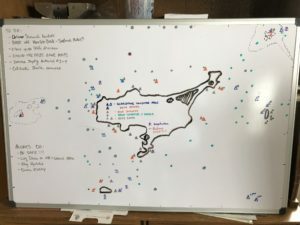 In addition to setting the SPATTs in the small boat harbor, we deployed them at four of our dive sites in order to be able to dive, retrieve, and replace them later. Finally, after two and a half weeks we finished our early season preparations and will be ready to start diving when we return from our two week break on June 24th. 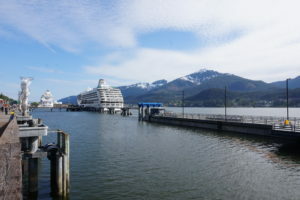 Yesterday, June 7th, we made it back to Juneau where I met up with Jared’s advisor, Dr. Ginny Eckert, to join her on a short trip to assist with some of her other students’ research on Prince of Wales. I am currently writing from her boat, The Lituya, which we will be on for two nights as we bring supplies down to the island. The mountains and snow along the passage are like nothing I’ve ever seen before, so I’m loving these few days to relax, take in the views, and hopefully see some whales! Its been a completely unique experience for me already these last two weeks so I can’t wait to see what’s next. On our last day, just before we flew out of Saint Paul, a walrus was spotted off East Landing on the island! Having not seen a walrus come to Saint Paul in nearly 15 years, this was an extra special day to see my first walrus. I had already checked my bag, which had my camera, at the airport but luckily a friendly bird guide let me borrow his binoculars and I was able to take a few pictures with my phone through the binoculars! This entry was posted in 2018 Mitchell AAUS, Current Internships, Internship Journeys on June 13, 2018 by Lena Block.